If you've worked on any modern (as in post 1937) wheel/brake set ups, you know that all the bearings are mounted inside the wheel hub. This is not the case with the earlier style wheels/brakes used on Harley's V-series (1930-1936). Instead, the V-series uses bearings mounted in both the wheel hub and inside the brake hub. 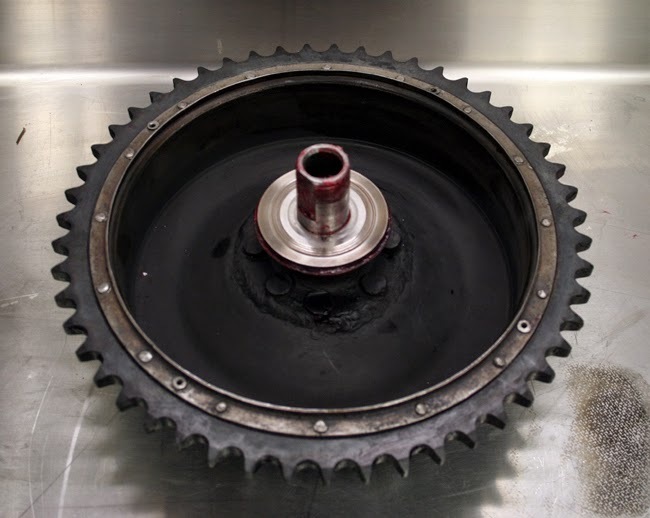 Spreading the load between two sets of bearings in the wheel and brake hubs may sound like a good idea, but in reality it leads to more maintenance and more chances for failure. Still, I've decided to keep the bike as original as possible and will be running it with the original set up. 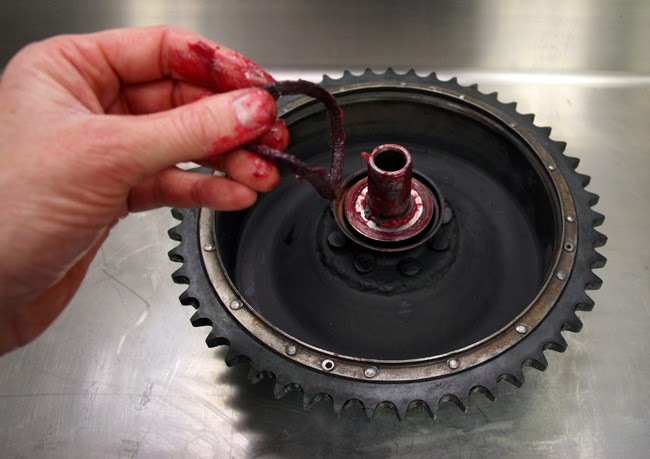 When rebuilding the brake hub, the first step is always to carefully clean all the parts. 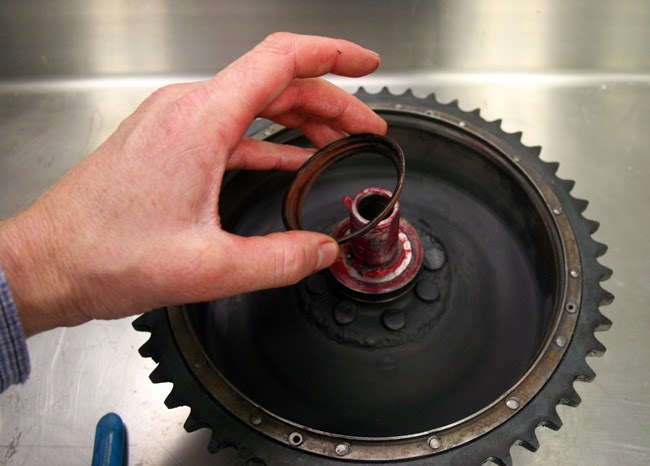 Start by degreasing them with parts cleaner before giving them a final rinse in lacquer thinner. 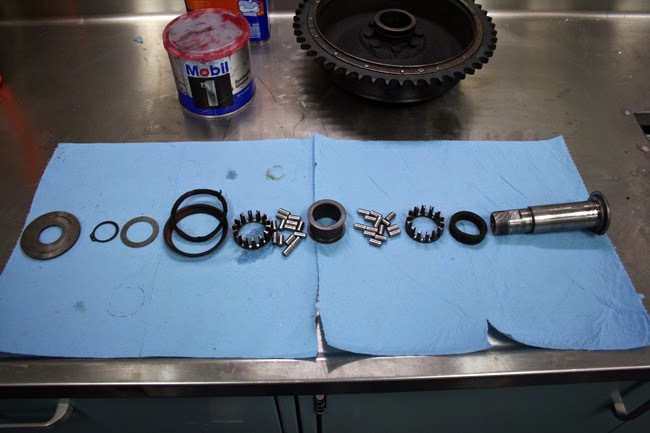 Once everything is clean and dry, you'll want to inspect the roller bearings for wear and see how they fit inside the hub without grease. A set of calipers will help you determine how badly your bearings are worn. It's also good to have both standard and various sizes of oversize bearings on hand so you can "feel the difference" between them on a dry assembled hub. For my set up, the standard size bearings fit perfectly, while the first oversize bearings were just a little snug, prompting me to install a new set of standard size bearings. Once you have your bearings sized, you can start on assembly. 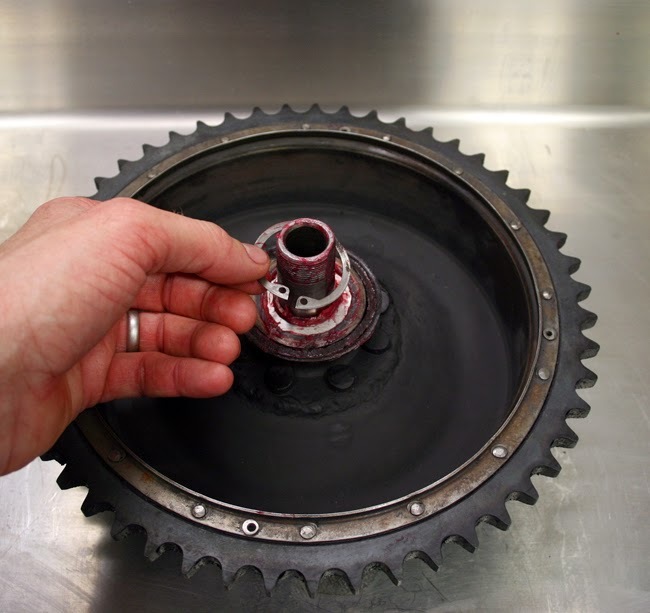 First you'll need to install the felt washer onto your axle sleeve. 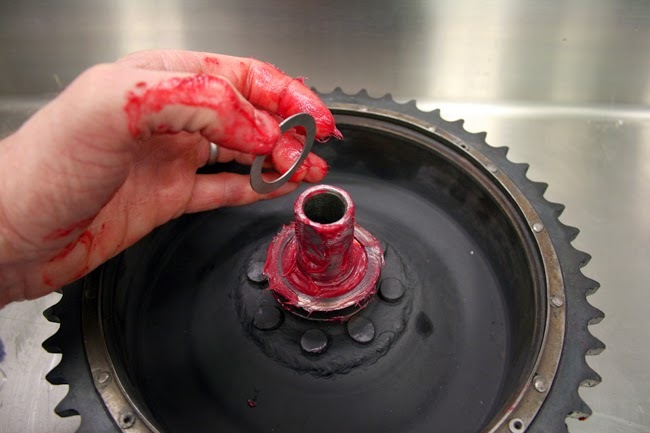 Make sure to squeeze it full of fresh grease as these felt washers act as seals in place of rubber o-rings that you might find in a newer machine. Now comes the bearing installation. I like to really load up my bearings with grease as I would rather wipe off extra then find out I didn't have enough when the bearing seizes going down the road. The first bearing cage is installed into the hub with the open side pointing towards the middle. Following the first bearing set is the aptly named bearing spacer. I added plenty of grease to the outside of the spacer to fill in the gap between it and the hub. 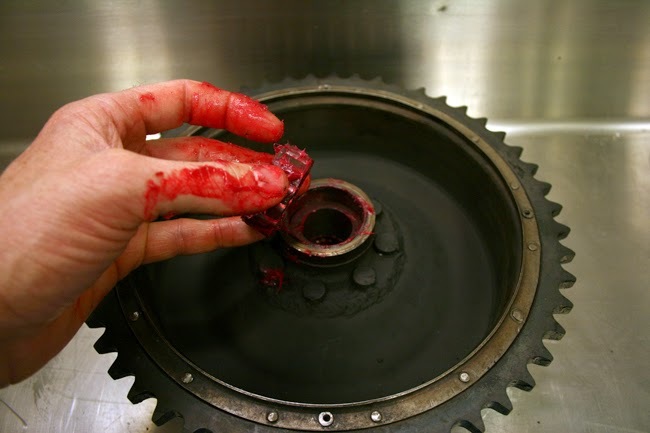 My thinking was having an empty space there could allow grease to escape from the bearings. It should be no surprise that the other bearing set goes in next. Again, load it with plenty of grease and install with the open side facing the center. Holding the brake drum sideways, insert the axle sleeve into the backside of the drum. 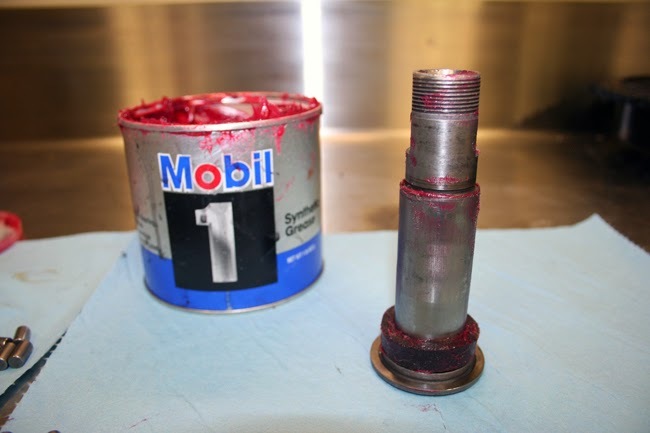 Make sure you are not pushing the bearings out the other side while installing the axle sleeve. Flip the brake drum back over and slide the bearing retaining washer down over the axle sleeve. To hold the bearings in place, the final piece is a bearing retaining spring ring, which fastens on the inside of the hub (not on the axle sleeve). 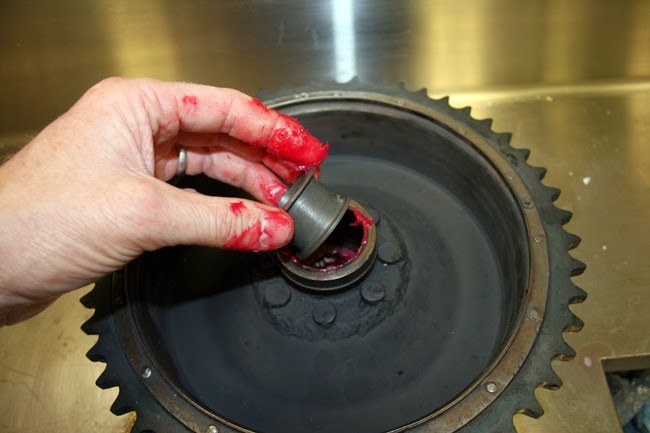 To keep all the bearing grease from entering the brake drum, there is another felt washer and a special retainer to hold it. The retainer slides down over the outside of the brake hub and seats against a shoulder that has been cut into hub at the factory. 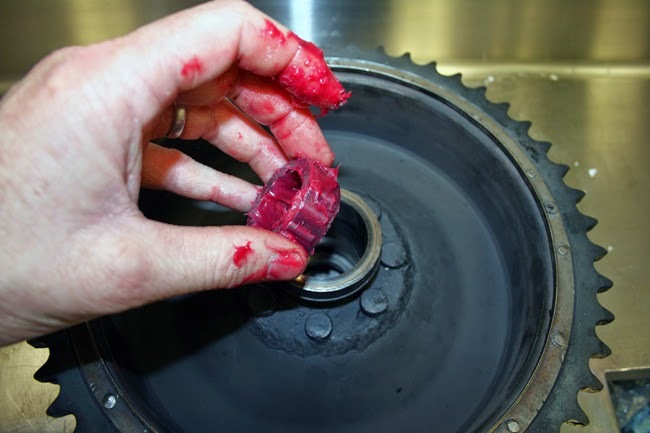 Load the felt washer with grease and fit it into the retainer. The wider flat side should be facing up and there should be no wrinkles or twists. The last step is to cap the whole thing off with the side cover collar which is essentially a large washer. 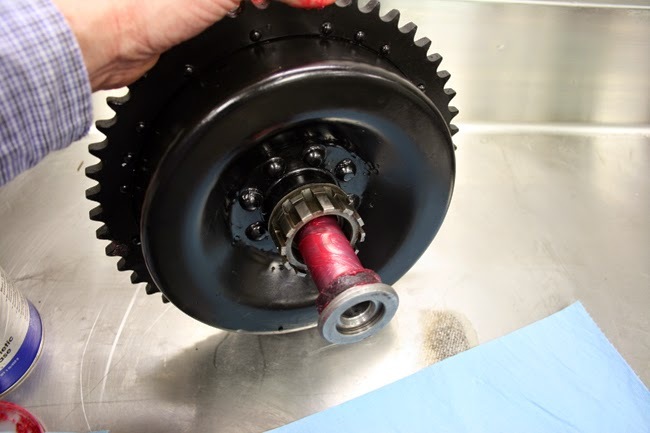 It slides over the axle sleeve and presses down against the felt washer to keep grease out of the brakes and water/dirt out of the bearings. And that's it. Now the hub is ready to have the brake shoes and baking plate installed.